The countdown to the National Senior Football teamâs meeting with Nicaragua is one week away. The local lads were expected to leave earlier today for Miami, for a five-day camp, before heading to the Central American country. 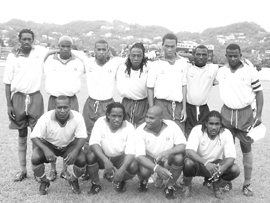 Last Sunday, Team SVG blanked Martinique 2-0, in the last friendly. Goals in both halves gave the morale boosting win. Shandell Samuel put SVG one up in the 39th minute, after receiving a square pass from Renson Haynes. This goal came following a close call for the Vincentians, when a Martiniquan forward fell after a tackle in the home sideâs penalty area. However, referee Timothy Hazelwood waved play on, as the visitors openly remonstrated at the decision. The youthful Martiniquans came out bursting in the second period. They made several forays on the Vincentians, numbing the local supporting. Some crisp passing and nifty footwork had the Vincentians chasing shadows. The visitors came close in the 78th minute, but the goal-intended-shot ricocheted off the left upright, with goalkeeper Melvin Andrews beaten. Veteran forward Alwyn âParpyâ Guy, in combination with Samuel, split the Martinique defence during injury time. Guy buried a powerful left foot shot from close range which put the lid on the outcome. Head coach of the local team, Aide Shaw, believed that last Sundayâs better showing hinged on the teamâs use of the Arnos Vale Playing Field prior to the match. He also alluded to the 4-4-2 formation in Sundayâs match; a formation which the players were accustomed to. Shaw believes strongly that his team is âon trackâ for its next major assignment. Shaw was expected to name the 18-member team to travel to Nicaragua earlier this week.